After a satisfying fourth day, it was time to move towards the climax on the 5th day of the Kashmir Great Lakes Trek. It was supposed to be the last day of climb. Satsar campsite is at an altitude of 12,000 ft and Gangabal campsite is at a an altitude of 11,500 ft but on the way we have to cross the Zach pass at an altitude of 13,400 ft.
Its early morning after a wonderful night of stargazing. You just can’t imagine, how this sky looked like in the night. Its cold still, but all ready to move. Its getting brighter and campsite is buzzing with early morning activities. Its climb right from the word- go. A steep fall on the left and cliff on the right. We had to cross through boulders and loose rocks. Looking back at the Satsar campsite from bit of height. It is tiring though. Crossing boulders is always tricky and tough on knees. Reaching to another ridge. Time to have some rest after having crossed most of the rocky terrain. Looking at those mountains make you you so humble. Closer look at the mountains far on the other side of the valley with a stream flowing down. Though flowering season has almost ended, but we could still find some smaller carpets here and there. They were indeed moment of pure joy. Everybody assembled on the pass with twin lakes in the background. Tricolour was unfurled and numerous pictures were clicked with every possible angle. What was one of the best places to click an image of the lifetime… our guide stands here. Harmukh Peak in its full glory. See hoe the snow cover its edges. The view of Gangabal lake (also called as Harmukh Ganga) located at the foot of Harmukh peak, as seen from the Zach Pass. It is one of the most sacred places for Kashmiri Hindus. It is now descent of around 1400 ft till the campsite. Looks easy? Not so, if you see from this side… Mules on their way to the campsite at Nandkhol. It isn’t a straightforward descent as well. What we see is the first halt in a valley at the base of Zach Pass in this side. We can see some shepherd huts and a small stream flowing down from Gangabal lake. Another view of the Harmukh peak in the glaring sun. Reaching at the first stream. There is another small hill to climb, before another descent. Time to relax, as we were aware that campsite isn’t far now. The perennial trekkers for the company in this huge meadows. The Harmukh Glacier that feeds the twin lakes. Glazing in the sunlight. Whodunit? A rock as big as this one, cut into two pieces in the manner would have been due to hell of a happening! Finally the campsite on the banks of the Nandkhol lake. Looks so pristine! The man-made bridge to cross the stream coming from Gangabal lake towards Nandkhol Lake. Finally, the Gangabal lake an altitude of 3570 metres. This fish is home to many types of fishes including rainbow and brown trout. Joy of reaching the climax! July to August is the best time to be here. You will find more snow if you are here in June. You feel so calm and relaxed here. Having visited the Gangabal lake in he evening itself, there was an urge to go there again in the morning. 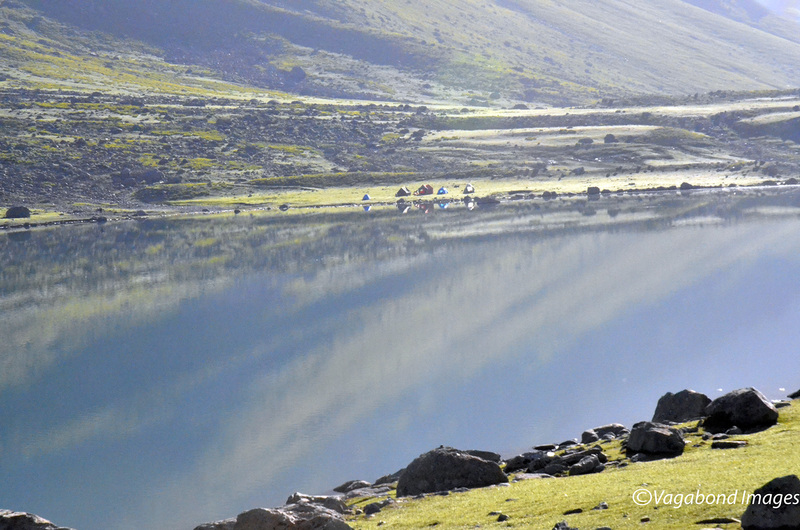 Campsite was at Nandkhol lake and it is almost a 20 minutes trek between the two lakes. So, quite determined, it was the early in the morning. Mules were getting themselves ready for another hard day. It was getting brighter on one side. And then, there were first golden rays of sun on the Harmukh Peak. The 4th Day: A tale of seen Lakes – Gadsar to Satsar Sun was very quickly to its full glow.. Calm waters of Gangabal lake in the morning. But it was still not calm enough to get a clear reflection. You never feel like it is enough of the photographs. Its amazing that how nature keeps changing its colours. Kashmiri Hindus still come to this lake for many rituals or to pay homage to their ancestors. Locals often travel from Naranag to Gangabal for fishing or just a short trek. Light falls on the Gangabal lake and the whole colour of the nature changes once again. Have you been to Kashmir Great Lakes Trek? How was your experience? Please share in the comments section below. Previous page Previous post: Rub your eyes to believe this amazing view!